Compressed air represents a secondary source of power that is clean and easy to handle. All types of Ortlinghaus clutches and brakes therefore are offered with pneumatic actuation. In many production shops a powerful compressed air network is already present, compressed air is “clean” and there is no danger of fire in the case of leaks. It is simple to transport and to control and permits in addition rapid and precise operating times even at high operating frequencies. Furthermore the amount of maintenance required for both the compressed air supply system and for the pneumatic clutches and brakes is small. With torque ratings ranging from 20 Nm to over 100,000 Nm the pneumatic range of clutches and brakes are widely used in all fields of mechanical engineering. Operating pressure of 5.5 bar is required to a maximum of 6.0 bar. Friction combination: Cast iron/organic friction lining or cast iron/friction block of organic friction material. Air intake: Via rotary inlet through the shaft. Application: On stamping and forming presses, on deepdrawing presses, embossing presses and similar machines. This series offers both the advantages of oil cooled wet-running plates, as with series 0-023 and 0-123, together with, pneumatic actuation. Pneumatic actuation can be of advantage when hydraulic oil is not available or economically does not appear advisable. Key connection or locking assemblies for securing the clutch/brake to the shaft are available. Air and cooling oil intake: Via rotary inlet through the shaft. Application: In stamping, embossing and deep drawing presses and similar machines. Fully encapsulated, oil cooled clutch/brake combined units in two sizes which are matched in terms of their torques and dimensions to electric motors of sizes 100, 112 and 132. The units are offered with various housings such as foot mounted and shafts or with hollow shafts and securing flanges. A significant increase in the engaging performance can be achieved using an externally mounted electric fan and by circulating oil through the housing. Air intake: Connection on the housing. Application: Where high switching frequency and excellent, repeatable stopping is required as, for example, with packing, metering and cutting machines, i.e. everywhere where rapid and precise movements or feeds are required. These pneumatically engaged, spring-released clutches with up to three plates and pneumatically released, spring-applied brakes with up to two plates utilise identical components. The plates of the single and two-plate versions are internally air-cooled which allows excellent heat dissipation and therefore high operation speeds. The three-plate version of the clutch is recommended for applications where the transmission of high torque is required, however, it is not possible to use the three plate version as a brake. The brakes can be matched precisely to the particular application by correct selection of the springs. External cooling increases the thermal capacity of the brake considerably. For particular applications where there is high dynamic work or alternating torques as with deep drawing presses, the clutch and brake can be fitted with friction blocks instead of linings. The extremely small moments of inertia of the hub and inner plate combined with the small air volume of the actuating cylinder, enable high engagement rates and short switching times to be achieved. As a rule not only the clutch but also the brake is mounted on the shaft end. Air intake: Via a rotary inlet with the clutch and on the fixed cylinder of the brake. 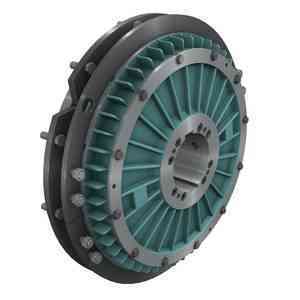 Application: These clutches and brakes are for “heavy duty work” in general mechanical engineering. In particular, hot forging presses, cold forming machines or shears in rolling operations. They can be used, not only individually, but also as a pair when single cycling is required. The brakes are approved by the relevant German Employer’s Liability Insurance Association, as auxiliary brakes in press drives where they can supplement single-plate clutch/brake combined units when an appropriate monitoring function is provided. Based on well known design principles, that have proved themselves in applications over many years, these clutches are to be found in use where compressed air is the preferred source of power, for reasons of cleanliness or rapid engagement times. The 0-421 is designed for dry-running only, the series 0-409 however can be fitted with sinter plates for dry- or wet-running. Application: Primarily in vehicle auxiliary drives and in printing machines. These clutches are comparable in terms of their performance with those of series 0-421. However they offer, in addition, the advantage of a stationary cylinder, as a result air intake holes in the shaft and separate rotary inlets are not required. Friction combination: Steel/organic friction lining. Air intake: On non rotating cylinder. Application: Primarily in cases where a free shaft end is not available as, for example, in the case of vehicle auxiliary drives and printing machines. These spring-applied fail safe brakes have the same form of construction as the hydraulically released brakes of series 0-022, the difference being that they are released with compressed air which is fed into the stationary cylinder. Precise operation and tough construction of the steel/organic lining friction combination characterise these brakes. There are versions with or without a centering function and in addition an emergency release facility can be fitted to enable the brake to be released should the compressed air supply fail. Application: With pneumatic drives in general mechanical engineering or for safety applications, for example with mining machines. A spring-applied fail safe brake with the friction combination steel/special sinter for dry-running, which can be used for both holding and dynamic applications. Monitoring of the brake position by means of microswitches. Emergency release by means of manual lever or intergrated screws. Mounting of an operating valve directly onto the brake. Application: On electric motors and the shaft ends of machines and gearboxes. These clutches are recommended where high torques are to be transmitted, without slipping, in a confined space. Care must be taken that engagement is carried out when the shafts are stationary or when the difference in their speed is only small (maximum 50 min-1). The clutches are free of residual torque when disengaged. A choice can be made between clutches which are pneumatically applied (series 0-412-00.) or spring-applied, pneumatically released, (series 0-412-01.). In addition to the “normal tooth” version in which the plates can mesh at any point, there is also a tooth design available which can only mesh at one point on the circumference so that the shafts are always at the same position relative to one another when the clutch is engaged. Application: Auxiliary drives of high performance automatic printing machines.